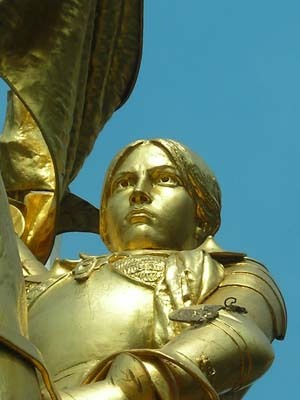 Will the Real Joan of Arc Stand Up? For more shots of this same statue go to Flickr. This article is based on Chapter Eleven of Jamie's new book, Beyond Cut-and-Paste, copies of which began shipping at the end of June. Order your copy. Table of Contents and sample chapters. There is the Joan of Arc we read about in Wikipedia and the Encyclopedia Britannica.
. . . a peasant girl who, believing that she was acting under divine guidance, led the French army in a momentous victory at Orléans that repulsed an English attempt to conquer France during the Hundred Years War. Captured a year afterward, Joan was burned by the English and their French collaborators as a heretic. She became the greatest national heroine of her compatriots. Wherever I come across your troops in France, if they are not willing to obey I shall make them leave, willing or not; and if they are willing to obey, I will have mercy upon them. She comes on behalf of the King of Heaven  an eye for an eye - to drive you out of France. And the Maiden promises and guarantees that she will cause such a great clash of arms that not for a thousand years has there been another one so great in France. The tone of her letter to the English seems a bit imperious when you read the entire piece. If one did not note that she was illiterate and could not write, one might assume the words were hers and use them to substantiate a critical assessment. In fact, according to the translator, Allen Williamson, the letter was dictated to a cleric and Joan later denied having dictated certain portions and using the third person. The tone we note may have been the voice of the scribe, not the voice of Joan. It will remain a mystery, as with much of history. When we turn to statues, posters and paintings, the task of verifying the portrayal is also quite challenging. It is difficult to figure out who the real Joan was, even if we take the time to read the transcripts from her two trials and her correspondence. But it is even more difficult to find an image of Joan that stands up to scrutiny and might resemble the real Joan. As far as we can tell, there is no image available today that was created during her time by someone who actually saw her and painted her from life. 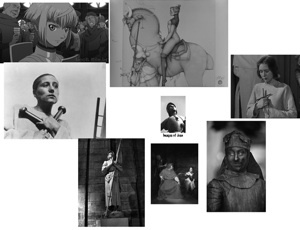 Unfortunately, many of the images so freely available to students online may distort the persons character in a number of ways, whether they be learning about Joan of Arc, George Washington or Matthew Flinders. In a cut-and-paste culture, students may be a bit too quick to capture an image of the person they are studying, snatching it up for a report without considering whether it is authentic. According to the creator of jeannedarc.info, Søren Bie, we have only one image of Joan created during her lifetime and that artist never actually saw her. The artist, Boutet de Monvel had very strong feelings about Joan. While vivid, art of this kind may exaggerate her feats, glorify her personality and contribute to a mythology somewhat in conflict with reality and history. In concert with the rest of this book, we would hope that students will learn to question the validity of historical images as a source of information about figures in history. We teach them not to take images at face value. An activity that works well to develop this questioning engages the students in collecting images about a figure from history like Joan from Google Images. They may paste a collection like the one on the left into a word processing document or a mind mapping program such as Inspiration or Smart Ideas. Go to Google Images and find at least ten images of your person from history. Keep track of the locations of these images on the Net. Once you have your collection, try to rank them in terms of historical accuracy, placing the most accurate on top and the least accurate at the bottom. While ranking the images, develop a case for why you are ranking them in this way. What is it about the image that lends it more or less credibility than the others? In the case of Joan, there is some testimony in the transcripts of her trials that can be used to assess the accuracy of the images. When Jeannette was at Vaucouleurs, I saw her dressed in a red dress, poor and worn. I asked her if she could make this journey, dressed as she was. She replied that she would willingly take a mans dress. Then I gave her the dress and equipment of one of my men. Afterwards, the inhabitants of Vaucouleurs had a mans dress made for her, with all the necessary requisites. He begins his attempt with the following admission: "There is not enough surviving evidence to give us any certainly as to what Joan looked like." Students can find Richeys analysis by doing a Google search for the exact phrase Joans Personal Appearance. This will take them to his book and the Appendix C online. By engaging students in the search for evidence and following up with the testimony of an historian searching through the clues, the teacher gives them a firm grounding in the process of verification so they will always question the accuracy of images they find rather than taking them at face value.